On Sunday, December 2nd, 2018, Cardi B rode a private jet and ate crab legs while the whole world watched. Cardi uploaded the crab leg video to Instagram and simply captioned it “good veneers,” because for some reason the private jet didn’t come with a seafood cracker and the rapper had to break those shells with her teeth. (Good veneers indeed.) Since she uploaded the video, the internet has been reacting to the seemingly innocuous show of wealth with all sorts of “mood af” and “queen” comments. Some have even called the video legendary, while others are calling it the new ASMR. Speaking of ASMR, remember when Cardi actually did ASMR? There is something oddly satisfying and hypnotic about the video, and Cardi seems blissfully unaware that she is being filmed. She struggles to eat a crab leg and silently works at it for about a minute. Cue us and the rest of the internet: WE WANT MORE. Also, shout out to the plate of scampi sitting next to the giant bag of crab legs. The next night, Cardi uploaded another Instagram Story of a new plate of crab legs. #Goals. Although the entire internet is entranced by this video, the rapper's dentist was not. 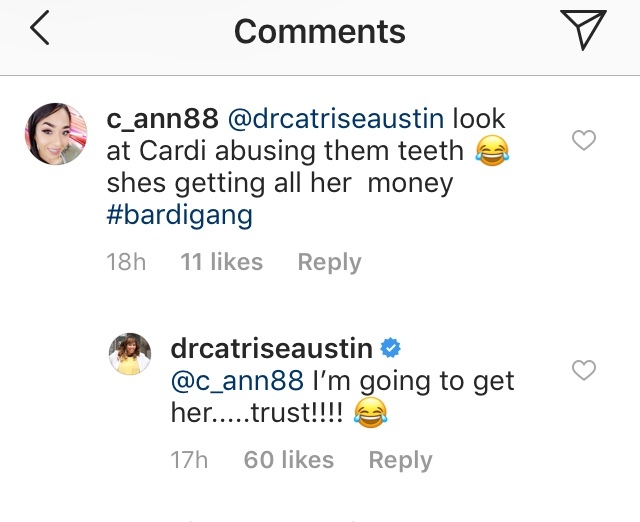 Cardi's dentist, Dr. Catrise Austin, commented on the video with what sounds like a hint of disapproval: "I'm going to get her...trust!" We don’t really know how to eat crab legs either, but maybe you aren’t supposed to test the strength of your expensive veneers on them. Either way, we’re hungry now and had no idea that crab leg-based ASMR would put us into the deepest chill. Thank you Cardi “crab leg queen” B.